NORWALK — Raven Bagnati sat before a table in the first-grade hallway Monday morning at Columbus Magnet School pressing buttons on a small plastic cash register. Fellow students walked nearby holding circular trays stacked with sample cups filled with slices of cucumbers and peppers. Others stood at a long table full of kiwis, avocados and corn, ready to pass the produce out to prospective shoppers. The activity marked the start of this year’s Nature’s Rainbow Market, where the school’s first-grade hallway transforms for a week annually into a produce market where school community members can purchase fresh fruits and vegetables. 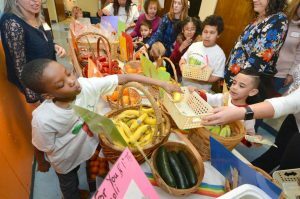 Bagnati, a first-grader herself, said the event was the culmination of several weeks spent in class learning about fruits and vegetables and where they come from. Bagnati’s father, Justin, said the family has a garden at home where they raise their own food, but that it’s good for his daughter to learn about produce markets because it furthers the concept of the connection between plant life, food and the individual. “Knowing where food comes from is very important,” Bagnati said. Teachers started planning this year’s take on the more than 30-year market-tradition in the first week of January. The idea, as is each year, is to meet a variety of social studies, science and literacy standards — ranging from being able to describe the goods people produce in the local community to how plants use sunlight to make food from the air and water they absorb — while giving students a real-world experience at the same time. “They really learn how our food goes from the farm to the table,” said Kelly Braddock, a first-grade teacher. “For the first-graders it’s one of the most exciting, engaging activities they will do all year,” she added. Lennox Easton agreed. The first-grade student said he had looked forward to the market. As a self-described salad chef, Easton said he spent the morning preparing cups of salad dressing and setting up food. But his favorite part, he admitted, was being able to take over as a cashier. After several weeks of learning about plants in the classroom, the first-grade students applied for jobs ranging from market managers to samplers to cashiers. As a part of the student learning, they were also asked to go to a local supermarket with their guardians. While there, they were told to ask about and take notice of things they saw such as signs, prices, etc. They then used what they learned to inform their decisions made while working at their own market. The students were left to decide how to set up their produce and how to design their own paper bags and T-shirts. 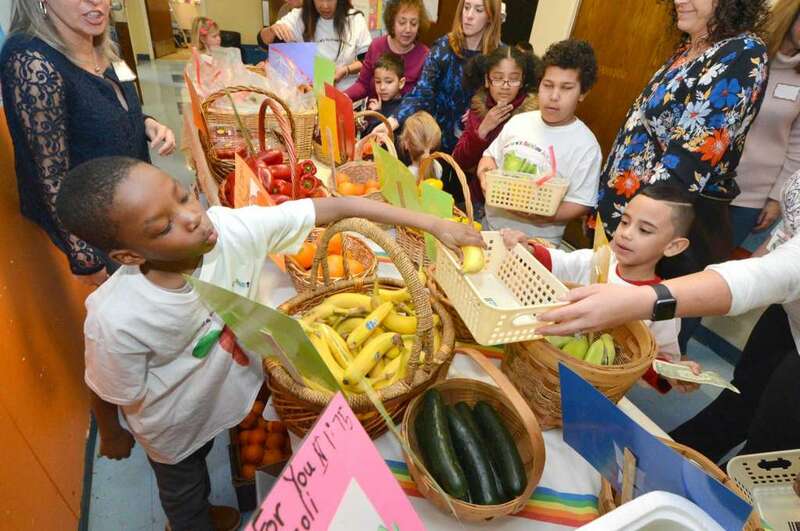 Then, Monday through Thursday of this week students from the rest of the school took turns, according to a schedule, taking trips through the first-graders’ hallway to sample fruits and vegetables and buy what they find appealing. “This is what first-grade economics looks like,” said Principal Medard Thomas, adding that there were also elements of arts, health and civics at play.